Last Friday, Elastic, which commercializes open-source search and log management software, went public. Elastic closed at $70 per share, 94% above its original price of $36 per share. Elastic’s strong pop and $5B valuation suggests investors are bullish on its ability to compete in the large log management market against Splunk, which IPOed in April 2012. There are a plethora of startups addressing log management. One reason why venture capitalists continue to fund companies in the space is that a start-up who captures only 7% of Splunk revenue generates a Total Enterprise Value (TEV) of $1.1B. Elastic filed to go public on Sept. 5th. On Sept. 24, it estimated that it would price shares in the range of $26-$29. On Oct. 2, the company provided a higher estimated range of $33-$35. The night before opening, the company announced that it had priced shares at $36, above the high end of the range. In addition to pricing above its higher range, during its first day of trading, Elastic saw its stock soar as much as 106%. The public markets appear receptive to open source infrastructure software businesses. Elastic competes in the large $9B IT operations management (ITOM) software market. IDC states, “ITOM software and SaaS solutions monitor, collect, normalize, correlate, report, and automate the analysis and response of systems and applications to nonscheduled events.” ITOM incorporates application performance management (APM), infrastructure monitoring and reporting, IT operations analytics, global event management applications, root cause analysis software, and log management and analytics. IDC estimates ITOM software spend will grow from ~$8B in 2017 to ~$12B in 2022, a 7% CAGR. 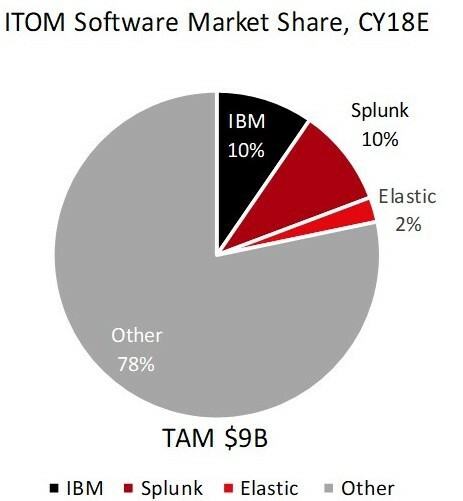 In the ITOM market, we estimate IBM and Splunk are market leaders with about 10% share each. Elastic is a fifth of the size with ~2% market share and has plenty of opportunity to grow. Elastic is not the only business going after Splunk. If an entrepreneur starts a business tomorrow that wins 7% of Splunk’s revenue, they will have built a billion-dollar business. Double clicking on the math: 7%*Splunk’s TEV ($15.4B)=$1.1B TEV. This assumes analysts apply Splunk’s 10.5x TEV/LTM revenue multiple to the new business’ revenue. We’ve come across numerous startups in the space. There are growth stage businesses like Sumo Logic to earlier ones like Loom, Timber, Graylog, LogRhythm, Scalyr, Coralogix, LogDNA, and Humio. DataDog, an observability company, has also added log management to its capabilities. The four main vectors of differentiation we’ve seen are: 1) uses some part of ELK vs. proprietary stack, 2) enterprise vs. mid-market customers, 3) on-premise vs. hybrid cloud, and 4) open-source vs. closed source business models. Since start-ups can capture 7% of Splunk’s revenue to generate a unicorn and there is a precedent of large exits in the space, we expect to continue to see investments in the category.